Need a nutrition reboot after a long weekend? 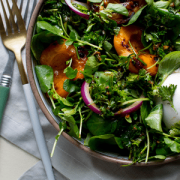 This Crunchy Avocado Kale Salad is perfect for getting you back on track for that productive week ahead. The avocado and kale fusion is loaded with vital nutrients. The best part about this salad is that all it takes is some slicing and dicing. You can buy whole kale and cut off the stem and chop into bite sized leaves or you can buy prepackaged kale without the stem and ready to eat. For those of you still transitioning from iceberg lettuce, feel free to try different greens that you might like better. Spinach is another green that offers a multitude of nutritional benefits. But for those of you ready for that kale powerhouse, this recipe is it. Kale is a leafy green vegetable that belongs to the Brassica family, a group of vegetables including cabbage, collards, and Brussels sprouts that have gained recent widespread attention due to their health-promoting phytonutrients. The kale helps to round out this recipe by providing vitamin K, A, and C, folate, B vitamins, copper, manganese, and even more fiber. Avocados are known for their healthy fats and potassium. Studies indicate that they may even help lower cholesterol levels. They bring so much flavor to anything you add them to, especially a salad like this one. The high fat content (keeping in mind they are healthy fats!) helps keep you full for hours along with the fiber from the kale. 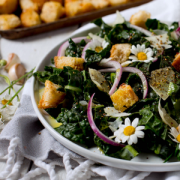 For this recipe, all you need to do is chop up your kale and avocado and mix in a bowl with you sunflower seeds (or any seeds you have) and olives. Top with one of our many homemade dressings like our Apple Cider Maple Vinaigrette or our Creamy Mint Infused Avocado Dressing. 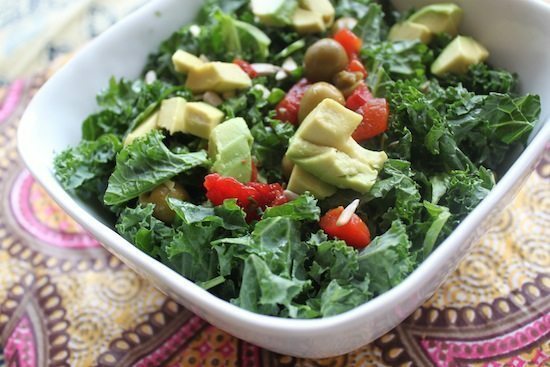 What other veggies do you like to toss into your kale salads? Let us know in the comments below! Enjoy with your favorite dressing! You can find some DIY dressings on our site. 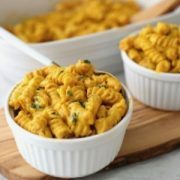 while this sounds tasty, why include a photo that clearly has things in it that aren’t listed in the recipe? is that red pepper? The red peppers are part of any spanish olive mix, which is def listed in the recipe. What dressing goes with this salad? You can dress this salad with whatever dressing you prefer. We posted 2 dressing recipes as part of the salad show we did, and I say the vinaigrette would go nicely with this. You can find it under the recipe page. Enjoy!